Great buy - does everything and more than I wanted. 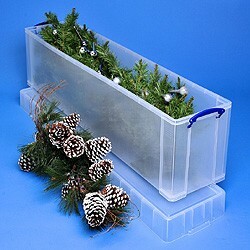 Fantastic boxes for storing all sorts of long objects. The plastic is perhaps a bit brittle and they do crack/chip a bit too easily, but there are no other boxes in this price range to compete, as far as I've found. I brought this for my Christmas tree - what a brilliant idea! I like it so much I brought another one! Yes, I recommend this product. It does what it says. Easy storage it sits in a corner in the garage - brilliant! Perfect size for what I need. Delivered on time and good quality boxes.